One big misconception is that product people (and entrepreneurs in general) are the ultimate “doers” of the world. People glorify the bold actions and the fast decisions, but all of this obscures the more subtle part of effective product people, which is all of the thinking that had to happen to ensure they were doing the right things. This misconception not only exists outside of the startup world, but also within it, where it is more pernicious. This misconception is one of the leading reasons some teams at early stage companies become ineffective. There has been a lot written about how to “think” (strategy books, decision making frameworks, design thinking articles, etc.) and there has been a lot written about how to “do” (UI design books, articles on writing well, presentation tips, etc). But I have found very little written about how to balance the two. And balancing the two is key because the best product people are incredible thinkers, effective doers, and great at balancing both. 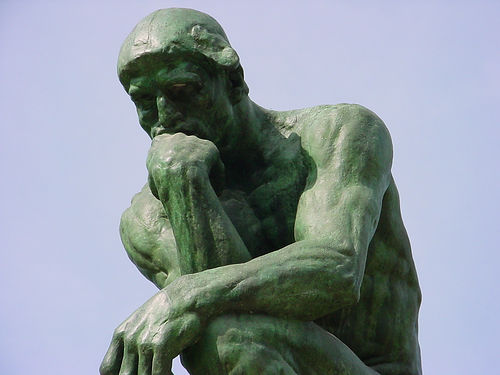 What is “Thinking”? What is “Doing”? “Thinking” activities: identifying customer problems, thinking through the right strategy, researching competitors, learning about the market, going to conferences, reading books, user story mapping, user research, understanding product metrics, etc. “Doing” activities: writing specs/briefs, writing job/user stories, giving presentations, running stand-ups, triaging bugs, etc. For example, lets say one month you spend the majority of your time writing many long feature specs in order to fill up the roadmap for the upcoming quarter (get a lot of stuff done). As a consequence you spend little time thinking about the underlying customer problems (little thinking). With so little time spend thinking, the features you spec’d will have a low probability of being right. Hence, your expected outcome will be low even though you got a lot of stuff done. Conversely, if you write zero specs (get nothing done) because you spend the majority of your time brainstorming (lots of thinking), then your expected outcome is also low, even if the right the ideas are in your head. Both extremes result in poor outcomes, and hence we have no choice but to wrestle with the tradeoff between thinking and doing. 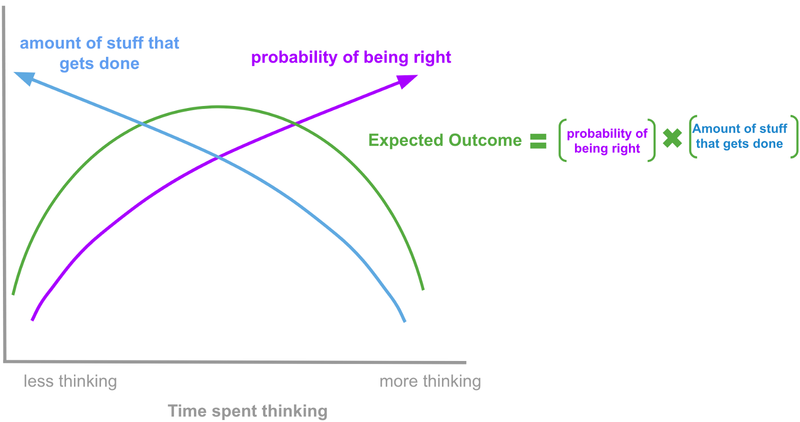 Note that there are diminishing returns to both doing and thinking (hence the shape of the curves): the 1st hour of thinking increases the probability of being right more than the 12th hour of thinking. The same is true for doing. 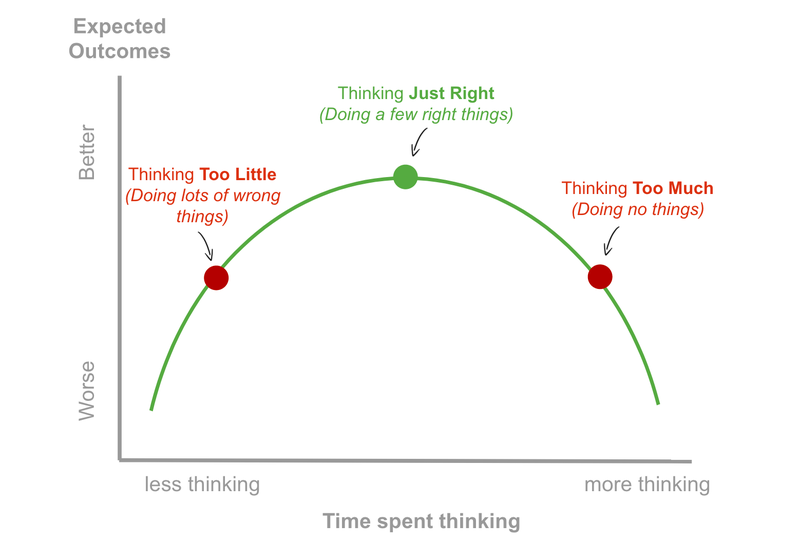 Thinking Too Little: when you think too little you will have enough time to get a lot of stuff done, but they will be lots of the wrong things. Thinking Too Much: when you think too much you will end up not having enough time to actually get anything meaningful done. 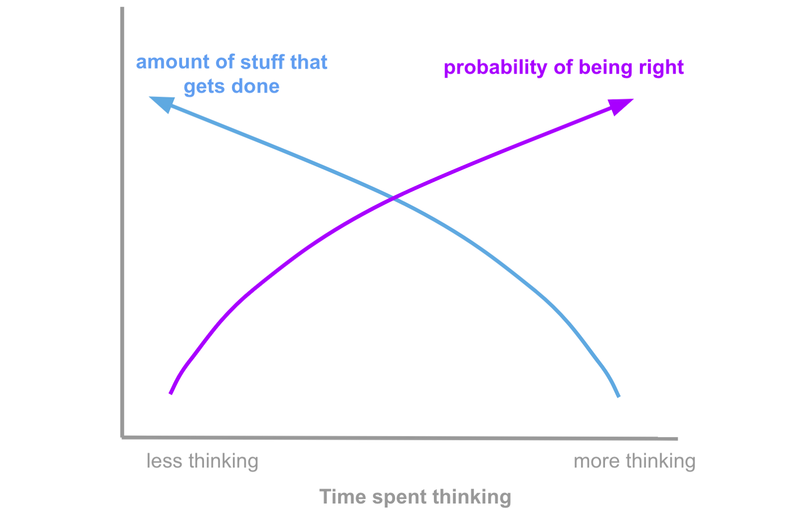 Thinking Just Right: when you think just right, you will end up only having enough time to do a few things since you spend a good chunk of time thinking, but the few things you do execute on will be highly effective. So how does one actually achieve balance in practice? The right balance will be different by role and situation; there is no universal ratio of thinking vs doing. Luckily however, there are a certain signs that can reveal whether or not you are balanced. You are task focused. You state your accomplishments in completed tasks instead of outcomes. This implies you are just blindly doing without thinking about impact. You aren’t hitting any of your goals. You work hard but nothing happens. This implies you’re doing the wrong things. Other’s don’t think you are performing well. You are the only one who can point to the list of work you have done. This implies your work hasn’t been used nor has it impacted anything. You keep failing for similar reasons. This implies you are doing the wrong things and not thinking through how to adjust from failure. You are knowledge focused. You state your accomplishments in terms of knowing the right answers, but not in terms of the actual impact you have had. This implies you are just thinking about issues without doing anything about them. You aren’t in the arena. You keep pointing out how other’s fail for easily avoidable reasons, but you yourself have neither had any meaningful successes nor failures. This implies you are thinking a lot about what one should do, but not jumping into the ring yourself. You keep changing your mind. This implies that you are reaching diminishing returns to thinking, and it is time to just act. You are outcome focused. You state your accomplishments in terms of the outcomes you have driven, not in terms of the tasks you have completed. This implies that you are taking deliberate action. You work hard and you say “no”. You work hard but say “no” to many work requests from different people. This implies you are focused on doing a few of the right things instead of letting yourself get stretched too thin and hence do many wrong things. Balancing “thinking” and “doing” is no easy task, but simply knowing that balance is what we should strive for allows us to avoid the trap of glorifying “thinking” or “doing” on their own. Through balance we drive better outcomes. I wrote down some thoughts on applying this framework to role definitions on product teams here: Thinking-Based Product Roles.